I've been thinking about this for a while and I'd like to see if anyone else has perhaps already done this. I pitched the idea of adding a new way of categorizing machines by their theme to one of the founders and he said they'd be open to adding that function if we compiled the list. I think this would be a great extra way to find machines you didn't necessarily know about. Has anyone already done this before? I think it would work best if each game could be narrowed down to two themes since some games combine themes. I don't mind working on a spreadsheet to do this, but if people have already done this or would like to help that would be awesome! Great idea! I’m ready to implement this in our Game Database, as soon as a list of themes has been compiled. bump. i've started a list but if anyone has done this already that would be awesome! The late 1960's machines had lifestyle themes. The list is coming along nicely! Should we sub-categorize to make it easier to find/select a theme? So, for example, put all sports under "Sports" (that one's easy, but not sure about all the others). Making this thread front page sticky for a while to hopefully get some more input! For instance, say we are talking about a Bally - Bobby Orr's Power Play, It could be tagged with both Sports as a broad theme, but also tagged as hockey in case people are just searching hockey. So yeah, a sub-category. is that possible to have multiple tags? I like the category with subs beneath it idea! Yes, but a lot of their catagories are so specific you can’t find similar machines sadly. Maybe combine things so that animals and jungle are under “nature” or “natural” because they’re in the same vein. Yeah, great point. I think themes need to be in the form of tags. You could add up to 5 theme tags per game. Then search by one or more tags to find similar games. I like this idea. I was thinking that if you have too many categories that it may be difficult to find a game based upon category as a game could really reside in multiple categories. However your idea of implementing tags means that a game would actually fall into multiple tag searches as it would reside in more than one category so if you run a tag search you may find your game under 'Supernatural' and 'Horror' if the game was BSD. I think Adult would be fine. Looks like a solid start to me. I’ll try and get this implemented this week! 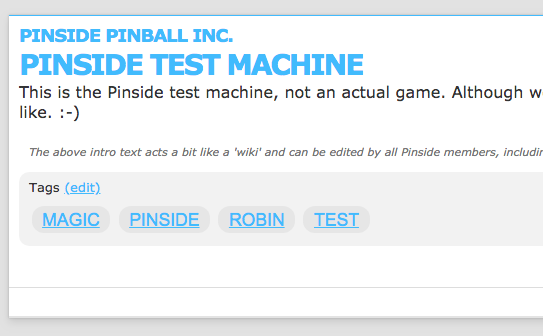 Another possibility, Robin, is to make a more generic ability to tag. One popular thing I've seen for an internal social use case was to let anyone free form tag things - and then people would +1 tags they recognize/approve of. Yeah, it had a bit of gamification to it, but overall worked kinda nice. The search engine was tuned to use the tag rankings for determining results order. Then again, there's enough.. people on Pinside... maybe this is a terrible idea. . Thinking more: it might be worth a generic tags ability; and then have a set of predefined (perhaps moderator defined) theme tags, feature flags (ie 4-player), perhaps others TBD. Given the crowdsourcing of applying those attributes, it could make the search pretty powerful. Has anyone already done this before? ! You can do a theme search on IPBD using the advanced search. 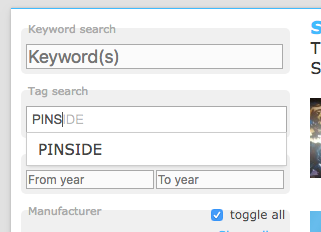 You can specify multiple tags (this is done in an 'OR' format, it will match any tags, not all). All the theme/category suggestions that were made in this forum thread have already been entered in the tags database, but the cool thing is that the tag field also allows you to enter new tags. Once a tag was added, it becomes available for everyone to use. Obviously, the tags list will be monitored for abuse and we do keep track of who adds which tags. Now, all that's left to do is add tags to the 2,500 games in the database! Let me know if you run into any issues or if you have any comments! FYI, I am also considering adding a similar tagging functionality to forum threads. This will help locate specific threads. E.g. look for threads that have been tagged with tags 'tech', 'issue', 'display', 'system 11'. Sweet, I started to do a few and noticed that some of the tags I listed in my initial list weren’t in your list. I noticed alien, space, medieval, music weren’t in there when I tried to do medieval madness, attack from mars or Iron Maiden. But, pretty easy to do! Thanks again for implementing this! Good ideas from everybody and thanks Robin for implementing this. Note: You cannot search or add the same tag to a game that already has that tag associated with it. Once the tag has been entered for one game it is now in the database and can be added to other games and searchable. Cool, thanks for getting that done! I did find one minor bug though. Seems like the tags with spaces aren't working. Example would be "Amusement Park" versus "Amusement-Park". Both are options for adding a tag and searching. When I added them both to RCT it looked like it worked, but when I went back only "Amusement-Park" was there, and when I searched "Amusement Park" it didn't find anything. Same thing with "Roller-Coaster" versus "Roller Coaster", thus the assumption all that have spaces aren't working. Didn't test any further though. One interesting way of displaying these tag relationships among games- e.g. to find games other people think are similar and share tags, would be to create a grouping algorothim that creates a phylogeny tree- games that share many tags will be grouped together. Initially this will be underpowered and not work well- but if you have a few tens of tags per machine and had 2500 machines it would be a super cool way to see how games are related! Happy to discuss more. This is a powerful way of finding relatedness and grouping similar together. Geeky- but I bet it works well. Just need to let a bunch of pinball geeks run wild with tagging games using descriptors- especially if there is a core set of some few hundreds of tags. This would not work as well if everyone used slightly different wording- so I like the idea of maintaining some core set of tag word descriptors. It can be arbitrarily large- just makes it so that you dont miss the relationship between english synonyms.